Life is not a problem to be solved. ACT shows how we can live full and meaningful lives by embracing our vulnerability and turning toward what hurts. In this landmark book, the originator and pioneering researcher into Acceptance and Commitment Therapy (ACT) lays out the psychological flexibility skills that make it one of the most powerful approaches research has yet to offer. These skills have been shown to help even where other approaches have failed. Science shows that they are useful in virtually every area—mental health (anxiety, depression, substance abuse, eating disorders, PTSD); physical health (chronic pain, dealing with diabetes, facing cancer); social processes (relationship issues, prejudice, stigma, domestic violence); and performance (sports, business, diet, exercise). How does psychological flexibility help? We struggle because the problem-solving mind tells us to run from what causes us fear and hurt. But we hurt where we care. If we run from a sense of vulnerability, we must also run from what we care about. By learning how to liberate ourselves, we can live with meaning and purpose, along with our pain when there is pain. Although that is a simple idea, it resists our instincts and programming. The flexibility skills counter those ingrained tendencies. They include noticing our thoughts with curiosity, opening to our emotions, attending to what is in the present, learning the art of perspective taking, discovering our deepest values, and building habits based around what we deeply want. Beginning with the epiphany Steven Hayes had during a panic attack, this book is a powerful narrative of scientific discovery filled with moving stories as well as advice for how we can put flexibility skills to work immediately. 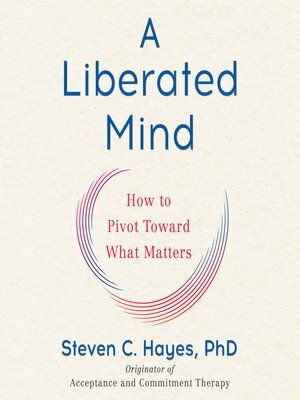 Hayes shows how allowing ourselves to feel fully and think freely moves us toward commitment to what truly matters to us. Finally, we can live lives that reflect the qualities we choose.